There's a popular outlet mall near where I live and folks from all over come to shop in droves. The food court was always packed with shoppers and vendors took advantage by passing out samples of their dishes to passing folks. My favorite sample was the Bourbon Chicken. But over the years, I found the taste to be too sweet as if chicken were just tossed in some bottled sauce and allowed to stay warm on a steam table. When I tried this recipe, I remembered those samples I enjoyed years ago but preferred how this tastes. It's a bonus knowing there's no sweet sauce involved either. This is great to prepare in advance and have ready to cook in a skillet after a long day. It takes no time at all to cook up and if you prefer, pound the chicken breasts thinner before marinating. You could even grill or bake the chicken if you didn't want to cook on the stovetop. 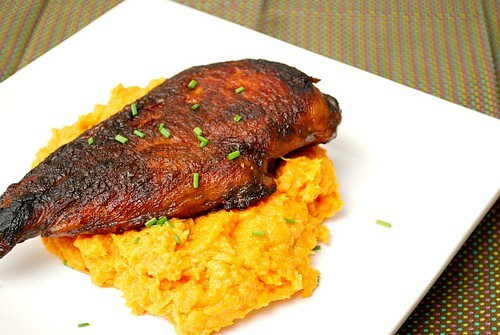 I served this over a bed of mashed sweet potatoes and a side salad. Place chicken breasts in a 9x13 inch baking dish. In a small bowl combine the ginger, soy sauce/tamari, onion powder, sugar, bourbon and garlic powder. Mix together and pour mixture over chicken. Cover dish and place in refrigerator. Marinate overnight. Remove chicken from the marinade and discard marinade. In a skillet over medium high heat, add the oil. When hot, place the chicken and cook on both sides until browned and cooked through. Oh yum - this looks fabulous. 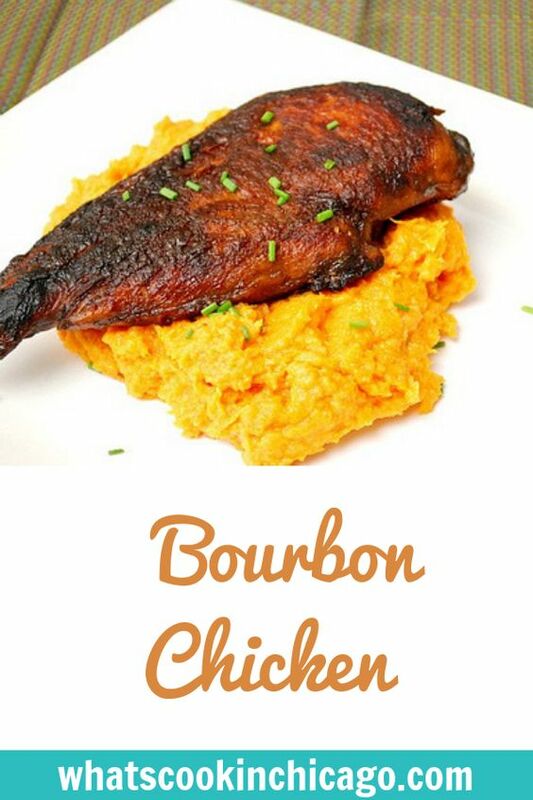 I love Bourbon chicken and I bet it tastes wonderful with the sweet poatatoes! This looks fantastic Joelen!! We eat tons of chicken because it is one of the few things my kids will eat. So, I am always on the lookout for new recipes to relieve my boredom. :D Now that the weather is nice, I can't wait to try this chicken on the grill.